Professors Guillén and García-Canal investigate the proliferation of the new multinationals. Many of these firms were marginal competitors until recently and are now challenging the world’s most accomplished and established multinationals. In their article they examine some fundamental questions in relation to this phenomenon. 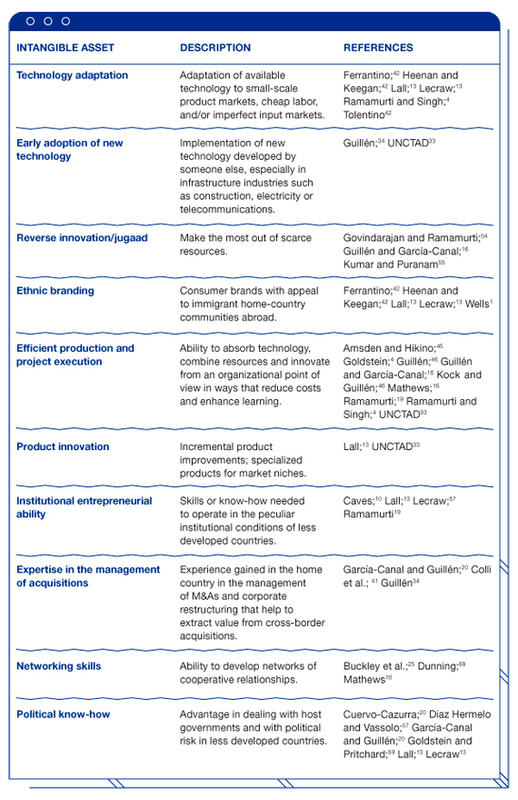 What common distinctive features do these firms share that sets them apart from traditional multinational enterprises? What advantages have made it possible for them to operate and compete not only in host countries at the same or lower level of economic development but also in the richest economies? How have they been able to expand abroad at such speed, defying conventional wisdom in relation to international expansion? In answering these questions they redefine the established theory of the MNE. They find that in effect, globalization, technical change, and the coming of age of the emerging countries have facilitated the rise of a new type of MNE in which foreign direct investment is driven not only by the exploitation of firm-specific competences but also by the exploration of new patterns of innovation and ways of accessing markets. Perhaps one of the most far-reaching developments of the last twenty years has to do with the rise of emerging economies, which once represented no more than 15% of the global economy and now have come to account for nearly 50% of economic activity. These economies are growing fast and are located around the world, including the BRICs (Brazil, Russia, India, and China), MITS (Mexico, Indonesia, Turkey, and South Africa), and many other economies in Africa, East Asia, South Asia, Latin America, and the Middle East. Some of these countries have become major exporters of manufactured goods while others sell agricultural, energy or mineral commodities. In the last few years, the emerging economies have also become major sources of foreign direct investment, that is, companies based in emerging economies have expanded throughout the world, making acquisitions and setting up manufacturing and distribution operations not just in emerging economies and developing countries but in developed ones as well, becoming Multinational Enterprises (MNEs). The proliferation of the new multinationals has taken observers, policymakers, and scholars by surprise. Many of these firms were marginal competitors just a decade ago; today they are challenging some of the world’s most accomplished and established multinationals in a wide variety of industries and markets. In this chapter we try to answer three fundamental types of questions. First, do these firms share some common distinctive features that distinguish them from the traditional MNEs? Second, what advantages have made it possible for them to operate and compete not only in host countries at the same or lower level of economic development but also in the richest economies? Third, how come they have been able to expand abroad at dizzying speed, in defiance of the conventional wisdom about the virtues of a staged, incremental approach to international expansion? Before being in a position to answer these questions, one must begin by outlining the established theory of the MNE and explore the extent to which its basic postulates need to be reexamined. Scholars in the field of international management have also acknowledged that firms in possession of the requisite competitive advantages do not become MNEs overnight, but in a gradual way, following different stages. According to the framework originally proposed by researchers at the University of Uppsala in Sweden,11 firms expand abroad on a country-by-country basis, starting with those more similar in terms of socio-cultural distance. They also argued that in each foreign country firms typically followed a sequence of steps: on-and-off exports, exporting through local agents, sales subsidiary, and production and marketing subsidiary. A similar set of explanations and predictions was proposed by Vernon12 in his application of the product life cycle to the location of production. According to these perspectives, the firm commits resources to foreign markets as it accumulates knowledge and experience, managing the risks of expansion and coping with the liability of foreignness. An important corollary is that the firm expands abroad only as fast as its experience and knowledge allows. The early students of the phenomenon of MNEs from developing, newly industrialized, emerging, or upper-middle-income countries focused their attention on both the vertical and the horizontal investments undertaken by these firms, but they were especially struck by the latter. Vertical investments, after all, are easily understood in terms of the desire to reduce uncertainty and minimize opportunism when assets are dedicated or specific to the supply or the downstream activity, whether the MNE comes from a developed country or not.13 The horizontal investments of the new MNEs, however, are harder to explain because they are supposed to be driven by the possession of intangible assets, and firms from developing countries were simply assumed not to possess them, or at least not to possess the same kinds of intangible assets as the classic MNEs from the rich countries.14 This paradox becomes more evident with the second wave of foreign direct investment (FDI) from the developing world, the one starting in the late 1980s. In contrast with the first wave FDI from developing countries that took place in the 1960s and 70s,15 the new MNEs of the 1980s and 90s aimed at becoming world leaders in their respective industries, not just marginal players.16 In addition, the new MNEs do not come only from emerging countries. Some firms labeled as born-global, born-again born-globals or born-regionals17 have emerged from developed countries following accelerated paths of internationalization that challenge the conventional view of international expansion. The main features of the new MNEs, as compared to the traditional ones, appear in Table 1. The dimensions in the table highlight the key differences between new and conventional MNEs. Perhaps the most startling one has to do with the accelerated pace of internationalization of the new MNEs, as firms from emerging economies have attempted to close the gap between their market reach and the global presence of the MNEs from developed countries.18 A second feature of the new MNEs is that, no matter the home country, they have been forced to deal not only with the liability of foreignness, but also with the liability and competitive disadvantage that stems from being latecomers lacking the resources and capabilities of the established MNEs from the most advanced countries. 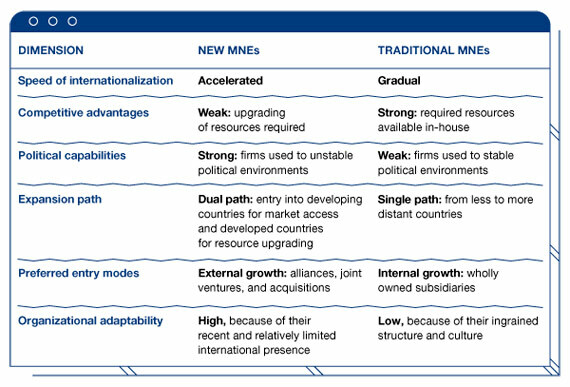 For this reason, the international expansion of the new MNEs runs in parallel with a capability upgrading process through which newcomers seek to gain access to external resources and capabilities in order to catch up with their more advanced competitors, that is, to reduce their competitiveness gap with established MNEs.19 However, despite lacking the same resource endowment of MNEs from developed countries, the new MNEs usually have an advantage over them, as they tend to possess stronger political capabilities. As the new MNEs are more used to deal with discretionary and/or unstable governments in their home country, they are better prepared than the traditional MNEs to succeed in foreign countries characterized by a weak institutional environment.20 Taking into account the high growth rates of emerging countries and their peculiar institutional environment, political capabilities have been especially valuable for the new MNEs. The first three features taken together point to another key characteristic of the new MNEs: they face a significant dilemma when it comes to international expansion because they need to balance the desire for global reach with the need to upgrade their capabilities. They can readily use their home-grown competitive advantages in other emerging or developing countries, but they must also enter more advanced countries in order to expose themselves to cutting-edge demand and develop their capabilities. This tension is reflected in Figure 1. Firms may evolve in a way that helps them to upgrade their capabilities or gain geographic reach, or both. 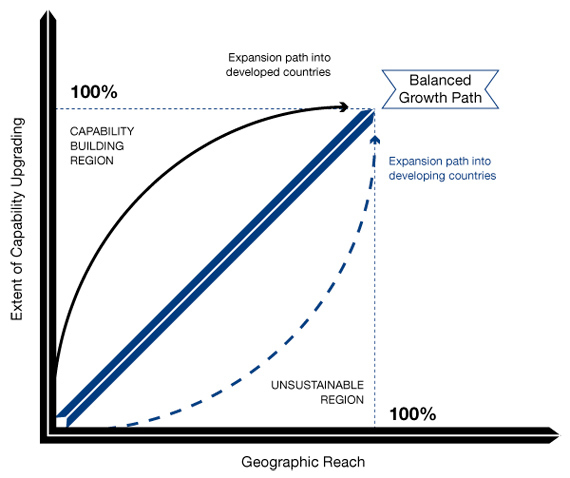 Although some emerging market multinationals can focus only on emerging markets for their international expansion, becoming what Ramamurti and Singh21 call local optimizers, the corporate expansion of the new multinationals typically entails moving simultaneously in both directions: capability upgrading and geographic reach. Along the diagonal, the firm pursues a balanced growth path, with the typical expansion pattern of the established multinationals. Above the diagonal it enters the region of capability building, in which the firm sacrifices the number of countries entered (i.e., its geographic reach) so as to close the gap with other competitors, especially in the advanced economies. Below the diagonal the firm enters the unsustainable region because prioritizing global reach without improving firm competences jeopardizes the capability upgrading process. The tension between capability upgrading and gaining global reach forces the new MNEs to enter developed and developing countries simultaneously since the beginning of their international expansion. Entering developing countries helps them gain size and operational experience, and generate profits, while venturing into developed ones contributes primarily to the capability upgrading process. The new MNEs have certainly tended to expand into developing countries at the beginning of their international expansion and limit their presence in developed countries to only a few locations where they can build capabilities, either because they have a partner there or because they have acquired a local firm. As they catch up with established MNEs, they begin to invest more in developed countries in search of markets, though they also make acquisitions in developed markets in order to secure strategic assets such as technology or brands. A final feature of the new MNEs is that they enjoy more freedom to implement organizational innovations to adapt to the requirements of globalization because they do not face the constraints typical of established MNEs. As major global players with long histories, many MNEs from the developed economies suffer from inertia and path dependence due to their deeply ingrained values, culture and organizational structure. Mathews26 shows how the new MNEs from Asia have adopted a number of innovative organizational forms that suited their needs, including networked and decentralized structures. When analyzing the foreign investments of the new MNEs of the 1960s and 70s, scholars focused their attention on two important questions, namely, their motivations and their proprietary, firm-specific advantages, if any. The following sections deal with these two issues. Table 2 summarizes the main motivations identified in the literature. As noted above, scholars documented and readily explained the desire of some of the new MNEs to create backward linkages into sources of raw materials or forward linkages into foreign markets in order to reduce uncertainty and opportunism in the relationship between the firm and the supplier of the raw material, or between the firm and the distributor or agent in the foreign market. Research documented, especially in the cases of South Korean and Taiwanese firms, their drive to internalize backward and forward linkages through the creation of trading companies, in some cases with government encouragement and financial support.27 For example, while during the 1960s a tiny proportion of South Korea’s exports reached foreign markets through the distribution and sale channels established by South Korean firms, by the 1980s roughly 50% of them were fully internalized, that is, handled by the exporters themselves.28 As would be expected, the new MNEs felt the pressures of uncertainty and asset specificity more strongly if they had developed intangible assets. For instance, using evidence on a representative cross-sectional sample of 837 Spanish exporting firms as of 1992, Campa and Guillén (1999)29 found that those with greater expenditures on R&D were more likely to internalize export operations. A survey performed by CNUCYD in 2006 of the empirical evidence determined that many of the new MNEs, especially in the extractive and manufacturing sectors, became multinationals when they internalized backward or forward linkages. It is cardinal to note that while the managerial, organizational, and political skills of the new multinationals may not be “patentable,” they are rare, difficult to imitate and valuable, the three conditions identified in the resource-based view of the firm as characterizing a true “capability”.61 The international expansion of the new multinationals cannot be understood without taking into account these non-technological proprietary intangible assets, which have enabled them to obtain scarcity rents in addition to the extraordinary profits arising from imperfect competition. Thus, intangible assets have played a key role in the rise of the new multinationals, but the assets themselves tend not to be technology and brands, as in the case of traditional multinationals,62 but managerial, organizational, and political in nature. In our recent book63 we have distilled the competitive capabilities of the emerging-market multinationals into seven principles that companies from any country in the world should adopt in order to be ready for the new kind of intense global competition of the 21st century. First, we argue that action should take precedence over strategy. In the rapidly changing global economy, companies need to experiment and to adapt incrementally rather than wait for the “perfect” strategy to arrive. We illustrate this principle with the rise to global prominence of Bimbo, whose emphasis on operations and execution rather than strategy enabled it to become the world’s leading bread company. The second principle has to do with niche thinking. Companies must follow the path of least resistance into foreign markets, which typically is a narrow niche they can dominate. Later, they can use that niche as a platform or beachhead for mounting an assault on the mainstream of the market. This is the strategy followed by Haier in the United States, a company that first targeted college students, and now is the world’s largest appliance brand in the world. The third principle involves building up scale fast so as to pre-empt competitors, attract price-sensitive customers, and build up market share. Samsung Electronics is perhaps the company that illustrates this principle best. It bet the farm by investing in huge factories for new products not just once but several times. It is now the world’s largest consumer electronics company. If scale is important in the global economy, so is the ability to embrace chaos, the fourth principle. Acer expanded throughout the world without fearing chaos, either externally or internally. It used a network of local partners to minimize risk and maximize adaptation. Today the company is the second largest personal computer brand in the world. In order to sustain rapid growth, and to learn new capabilities along the way, we propose a fifth principle which urges companies to acquire smart, in the dual sense of buying assets that complement its existing capabilities, and doing so at the right time and with a clear integration strategy in mind. Scale through internal and external growth should enable the company to implement our sixth principle: expand with abandon. We argue that if a company waits to make a foreign move until it is ready, then it has waited too long. Foreign expansion cannot be planned day by day. Companies need to be willing to experiment, to engage in trial-and-error, to expose themselves to new opportunities and ways of doing things. And it is at this point where our seventh, and most important, recommendation comes in. In this new, rapidly-changing global economy companies must abandon the sacred cows. What brought them success in the past cannot become a hindrance for pursuing the new opportunities that are becoming available around the world. The new MNEs are the result of both imitation of established MNEs from the rich countries—which they have tried to emulate strategically and organizationally—and innovation in response to the peculiar characteristics of emerging and developing countries. The context in which their international expansion has taken place is also relevant. The new MNEs have emerged from countries with weak institutional environments and they are used to operating in countries with weak property-rights regimes, legal systems, and so on. Experience in the home country became especially valuable for the new MNEs because many countries with weak institutions are growing fast and they had developed the capabilities to compete in such challenging environments. In addition, the new MNEs have flourished at a time of market globalization in which, despite the local differences that still remain, global reach and global scale are crucial. The new MNEs have responded to this challenge by embarking on an accelerated international strategy based on external growth aimed at upgrading their capabilities and increasing their global market reach. 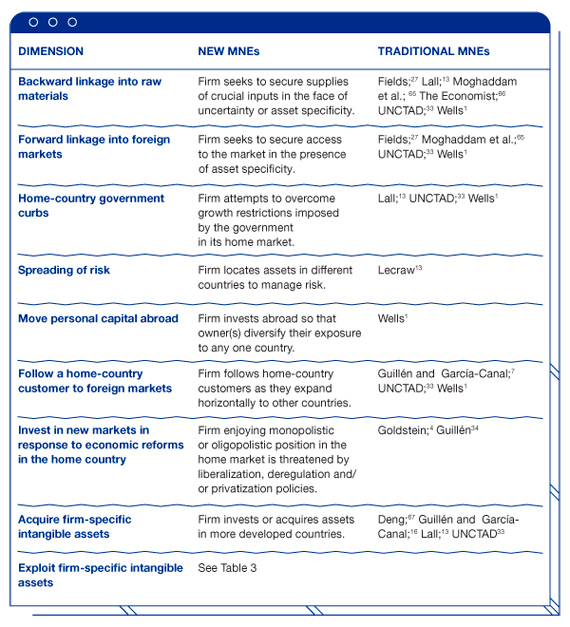 When implementing this strategy, the new MNEs took advantage of their market position in the home country and, ironically, their meager international presence allowed them to adopt a strategy and organizational structure that happens to be most appropriate to the current international environment in which emerging economies are growing very fast. It is also important to note that the established MNEs from the rich countries have adopted some of the patterns of behavior of the new multinationals. Increased competitive pressure from the latter in industries such as cement, steel, electrical appliances, construction, banking, and infrastructure has prompted many American and European firms to become much less reliant on traditional product-differentiation strategies and vertically integrated structures. To a certain extent, the rise of networked organizations64 and the extensive shift towards outsourcing represent competitive responses to the challenges faced by established MNEs. Finally, a special type of new MNE is the so-called born-global firm, which resembles the new MNE in many ways but has emerged from developed countries. Taking all of these developments into account, it is clear that the traditional model of MNE is fading. In effect, globalization, technical change, and the coming of age of the emerging countries have facilitated the rise of a new type of MNE in which foreign direct investment is driven not only by the exploitation of firm-specific competences but also by the exploration of new patterns of innovation and ways of accessing markets. In addition, the new MNEs have expanded very rapidly, without following the gradual, staged model of internationalization. It is important to note, however, that the decline of the traditional model of the MNE does not necessarily imply the demise of existing theories of the MNE. In fact, the core explanation for the existence of MNEs remains, namely, that in order to pursue international expansion, the firm needs to possess capabilities allowing it to overcome the liability of foreignness; no firm-specific capabilities, no multinationals. Our analysis of the new MNEs has shown that their international expansion was possible due to some valuable capabilities developed in the home country, including project-execution, political, and networking skills, among other non-conventional ones. Thus, the lack of the classic technological or marketing capabilities does not imply the absence of other valuable capabilities that may provide the foundations for international expansion. It is precisely for this reason that the new MNEs are here to stay. L.T. Wells Jr., Third World Multinationals: The Rise of Foreign Investment from Developing Countries (Cambridge, MA: The MIT Press, 1983). J.A. Mathews, Dragon Multinationals: A New Model of Global Growth (New York: Oxford University Press, 2002). P.P. Li, “Toward a Geocentric Theory of Multinational Evolution: The Implications from the Asian MNEs as Latecomers,” Asia Pacific Journal of Management 22.2 (June 2003), 217-42. Accenture, “The Rise of the Emerging-Market Multinational”, 2008; A. Goldstein, Multinational Companies from Emerging Economies (New York: Palgrave Macmillan, 2007); R. Ramamurti and J.V. Singh (eds. ), Emerging Multinationals in Emerging Markets (Cambridge: Cambridge University Press, 2009). Cuervo-Cazurra, “The Multinationalization of Developing Country MNEs: The Case of Multilatinas,” Journal of International Management, 14.2 (June 2008), 138-54. M.F. Guillén and E. García-Canal, The New Multinationals: Spanish Firms in a Global Context (Cambridge and New York: Cambridge University Press, 2010). CNUCYD (United Nations Conference on Trade and Development), “World Investment Report 2008” (New York & Geneva: United Nations, 2008). S. Hymer, “The International Operations of National Firms: A Study of Direct Foreign Investment,” PhD thesis (MIT, 1960), p.25 (publ. Cambridge: The MIT Press, 1976). For a summary of the basic economic model of the multinational firm, see R.E. Caves, Multinational Enterprise and Economic Analysis (New York: Cambridge University Press, 1996). Stephen Hymer  was the first to observe that firms expand horizontally to protect (and monopolize) their intangible assets. Other important contributions are: P.J. Buckley and M. Casson, The Future of the Multinational Enterprise (London: Macmillan, 1976); J.F. Hennart, A Theory of Multinational Enterprise (Ann Arbor: University of Michigan Press, 1982); and D.J. Teece, “Technology Transfer by Multinational Firms: The Resource Cost of Transferring Technological Know-How,” Economic Journal, 87.346 (1977), 242-61. J. Johanson and J.-E. Vahlne, “The Internationalization Process of the Firm: A Model of Knowledge Development and Increasing Foreign Market Commitments,” Journal of International Business Studies, 8.1 (1977), 23-32; J. Johanson and F. Wiedersheim-Paul, “The Internationalization of the Firm—Four Swedish Cases,” Journal of Management Studies, 12 (October 1975), 305-22. R. Vernon, “International Investment and International Trade in the Product Cycle,” Quarterly Journal of Economics, 80 (1966), 190-207; “The Product Cycle Hypothesis in a New International Environment,” Oxford Bulletin of Economics and Statistics, 41.4 (November 1979), 255-67. Caves, Multinational Enterprise, 1996, pp.238-241; S. Lall, The New Multinationals (New York: Wiley, 1983); D. Lecraw, “Direct Investment by Firms from Less Developed Countries,” Oxford Economic Papers, 29 (November 1977), 445-57; Wells, Third World Multinationals, 1983. Lall, New Multinationals, 1983, p.4. Lall, New Multinationals, 1983; Wells, Third World Multinationals, 1983. Guillén and García-Canal, New Multinationals, 2010; M.F. Guillén and E. García-Canal, Emerging Markets Rule (New York: McGraw-Hill, 2013); J.A. Mathews, “Dragon Multinationals,” Asia Pacific Journal of Management, 23 (2006), 5-27. C.G. Asmussen, “Local, Regional, or Global? Quantifying MNE Geographic Scope,” Journal of International Business Studies, 40 (2009), 1192-1250; J. Bell, R. McNaughton, and S. Young, “Born-again Global Firms: An Extension to the Born Global Phenomenon,” Journal of International Management, 7.3 (2001), 173-90; N. Hashai, “Sequencing the Expansion of Geographic Scope and Foreign Operations by Born Global Firms,” Journal of International Business Studies, 42 (2011), 995-1015; S. Khavul, L. Pérez-Nordtvedt, and E. Wood, “Organizational Entrainment and International New Ventures from Emerging Markets,” Journal of Business Venturing, 25 (2010), 104-19; T.K. Madsen, “Early and Rapidly Internationalizing Ventures: Similarities and Differences Between Classifications Based on The Original International New Venture and Born Global Literatures,” Journal of International Entrepreneurship, 11.1 (2013), 65-79; A. Rialp, J. Rialp, and G.A. Knight, “The Phenomenon of Early Internationalizing Firms: What Do We Know After a Decade (1993-2003) of Scientific Enquiry?” International Business Review, 14.2 (April 2005), 147-66; L. Zhou, W. Wu, and X. Luo, “Internationalization and the Performance of Born-Global SMEs: The Mediating Role of Social Networks,” Journal of International Business Studies, 38 (2007), 673-90. P.J. Buckley and N. Hashai, “The Role of Technological Catch Up and Domestic Market Growth in the Genesis of Emerging Country Based Multinationals,” Research Policy, 43.2 (2014), 423-37; Mathews, “Dragon Multinationals,” 2006. P.S. Aulakh, “Emerging Multinationals from Developing Countries: Motivations, Paths and Performance,” Journal of International Management, 13.3 (2007), 235-40; L.A. Dau, “Learning Across Geographic Space: Pro-market Reforms, Multinationalization Strategy, and Profitability,” Journal of International Business Studies, 44 (2013), 235-62; J.F. Hennart, “Emerging Market Multinationals and the Theory of the Multinational Enterprise,” Global Strategy Journal, 2 (2012), 168-87; D. Lessard and R. Lucea, “Mexican Multinationals: Insights from CEMEX,” in Emerging Multinationals, ed. by Ramamurti and Singh, 2009; P.P. Li, “Toward an Integrated Theory of Multinational Evolution: The Evidence of Chinese Multinational Enterprises as Latecomers,” Journal of International Management, 13.3 (2007), 296-318; Mathews, “Dragon Multinationals,” 2006; R. Ramamurti, “What Have We Learned About Emerging Market MNEs?” in Emerging Multinationals, ed. by Ramamurti and Singh, 2009, 339-426; A. Verbeke and L. Kano, “An Internalization Theory Rationale for MNE Regional,” Multinational Business Review, 20.2 (2012), 135-52. Cuervo-Cazurra, “Extending Theory by Analyzing Developing Country Multinational Companies: Solving the Goldilocks Debate,” Global Strategy Journal, 2 (2012), 153-167; A. Cuervo-Cazurra and M. Genc, “Transforming Disadvantages into Advantages: Developing-Country MNEs in the Least Developed Countries,” Journal of International Business Studies, 39 (2008), 957-79; F. Diaz Hermelo and R. Vassolo, “Institutional Development and Hypercompetition in Emerging Economies,” Strategic Management Journal, 31 (2010), 1457-73; E. García-Canal and M.F. Guillén, “Risk and the Strategy of Foreign Location Choice,” Strategic Management Journal, 29.10 (2008), 1097-115. Ramamurti and Singh (eds. ), Emerging Multinationals, 2009. E. García-Canal, C. López Duarte, J. Rialp Criado, and A. Valdés Llaneza, “Accelerating International Expansion through Global Alliances: A Typology of Cooperative Strategies,” Journal of World Business, 37.2 (2002), 91-107; J. Johanson and J.-E. Vahlne, “The Uppsala Internationalization Process Model Revisited: From Liability of Foreignness to Liability of Outsidership,” Journal of International Business Studies, 40 (2009), 1411-31. P.J. Buckley, S. Elia, and M. Kafouros, “Acquisitions by Emerging Market Multinationals: Implications for Firm Performance,” Journal of World Business, 49 (2014), 611-632; H. Rui and G.S. Yip, “Foreign Acquisitions by Chinese Firms: A Strategic Intent Perspective,” Journal of World Business, 43 (2008), 213-26. F. Bonaglia, A. Goldstein, and J.A. Mathews, “Accelerated Internationalization by Emerging Market Multinationals: The Case of the White Goods Sector,” Journal of World Business, 42 (2007), 369-83. P.J. Buckley, L.J. Clegg, A.R. Cross, X. Liu, H. Voss, and P. Zheng, “The Determinants of Chinese Outward Foreign Direct Investment,” Journal of International Business Studies, 38 (2007), 499-518; Buckley et al., “Acquisitions by Emerging Market Multinationals,” 2014; J. Lu, X. Liu, M. Wright, and I. Filatotchev, “International Experience and FDI Location Choices of Chinese Firms: The Moderating Effects of Home Country Government Support and Host Country Institutions,” Journal of International Business Studies, 45 (2014), 428-49. K.J. Fields, Enterprise and the State in Korea and Taiwan (Ithaca, NY: Cornell University Press, 1995), 183-237. D.S. Cho, The General Trading Company: Concept and Strategy (Lexington, MA: Lexington Books, 1987). J.M. Campa and M.F. Guillén, “The Internationalization of Exports: Firm and Location-Specific Factors in a Middle-Income Country,” Management Science, 45.11 (November 1999), 1463-78. Wells, Third World Multinationals, 1983. CNUCYD (United Nations Conference on Trade and Development), “World Investment Report 2006” (New York & Geneva: United Nations, 2006); Wells, Third World Multinationals, 1983. M.F. Guillén, The Rise of Spanish Multinationals: European Business in the Global Economy (Cambridge and New York: Cambridge University Press, 2005). J.F. Hennart argues that the greater efficiency in markets for assets and asset services in developed countries makes firms less diversified and, for this reason, more modular, i.e., easier to be taken over and integrated by an emerging market multinational willing to acquire external technology and know-how. Cuervo and B. Villalonga, “Explaining the Variance in the Performance Effects of Privatization,” Academy of Management Review, 25 (2000), 581-90. Buckley et al., “Acquisitions by Emerging Market Multinationals,” 2014; García-Canal and Guillén, “Risk and the Strategy of Foreign Location Choice,” 2008; Guillén and García-Canal, Emerging Markets Rule, 2013; M.W. Peng, “The Global Strategy of Emerging Multinationals from China,” Global Strategy Journal, 2 (2012), 97-107; M.B. Sarkar, S.T. Cavusgil, and P.S. Aulakh, “International Expansion of Telecommunication Carriers: The Influence of Market Structure, Network Characteristics and Entry Imperfections,” Journal of International Business Studies, 30 (1999), 361-82. Lall, New Multinationals, 1983, 4. Lall, New Multinationals, 1983; Lecraw, “Direct Investment,” 1977; Wells, Third World Multinationals, 1983. A. Colli, E. García-Canal, and M.F. Guillén, “Family Character and International Entrepreneurship: A Historical Comparison of Italian and Spanish New Multinationals,” Business History, 55.1 (2013), 119-38; A. Madhok and M. Keyhani, “Acquisitions as Entrepreneurship: Asymmetries, Opportunities, and the Internationalization of Multinationals from Emerging Economies,” Global Strategy Journal, 2 (2012), 26-40; Ramamurti and Singh (eds. ), Emerging Multinationals, 2009. M.J. Ferrantino, “Technology Expenditures, Factor Intensity, and Efficiency in Indian Manufacturing,” Review of Economics and Statistics, 74.4 (1992), 689-700; D.A. Heenan and W.J. Keegan, “The Rise of Third World Multinationals,” Harvard Business Review, 57 (January-February 1979), 101-9; Lall, New Multinationals, 1983; Lecraw, “Direct Investment,” 1977; Ramamurti and Singh (eds. ), Emerging Multinationals, 2009; P.E. Tolentino, Technological Innovation and Third World Multinationals (London: Routledge, 1993). Ferrantino, “Technology Expenditures,” 1992; Goldstein, Multinational Companies, 2007, 117-122; Lecraw, “Direct Investment,” 1977; Wells, Third World Multinationals, 1983. A.H. Amsden and T. Hikino, “Project Execution Capability, Organizational Know-How and Conglomerate Corporate Growth in Late Industrialization,” Industrial & Corporate Change, 3.1 (1994), 111-47. M.F. Guillén, “Business Groups in Emerging Economies: A Resource-Based View,” Academy of Management Journal, 43.3 (June 2000), 362-80; Guillén and García-Canal, Emerging Markets Rule, 2013; C. Kock and M.F. Guillén, “Strategy and Structure in Developing Countries: Business Groups as an Evolutionary Response to Opportunities for Unrelated Diversification,” Industrial & Corporate Change, 10.1 (2001), 1-37; Ramamurti, “What Have We Learned About Emerging Market MNEs?” 2009; Ramamurti and Singh (eds. ), Emerging Multinationals, 2009. Guillén and García-Canal, Emerging Markets Rule, 2013; S. Henningsson and S. Carlsson, “The DySIIM Model for Managing IS Integration in Mergers and Acquisition,” Information Systems Journal, 21 (2011), 441-476; P. Kale, H. Singh, and H.V. Perlmutter, “Learning and Protection of Proprietary Assets in Strategic Alliances: Building Relational Capital,” Strategic Management Journal, 21 (2000), 217-37; M. Ruess and S.C. Voelpel, “The PMI Scorecard: A Tool For Successfully Balancing the Post-Merger Integration Process,” Organizational Dynamics, 41 (2012), 78-84; M. Zollo and H. Singh, “Deliberate Learning in Corporate Acquisitions: Post-Acquisition Strategies and Integration Capability in US Bank Mergers,” Strategic Management Journal, 25 (2004), 1233-56. García-Canal and Guillén, “Risk and the Strategy of Foreign Location Choice,” 2008; Guillén, The Rise of Spanish Multinationals, 2005. Buckley et al., “The Determinants of Chinese Outward Foreign Direct Investment,” 2007. B. Elango and C. Pattnaik, “Building Capabilities for International Operations through Networks: A Study of Indian Firms,” Journal of International Business Studies, 38 (2007), 541-55; D.W. Yiu, C.M. Lau, and G.D. Bruton, “International Venturing by Emerging Economy Firms: The Effects of Firm Capabilities, Home Country Networks, and Corporate Entrepreneurship,” Journal of International Business Studies, 38 (2007), 519-40. V. Govindarajan and R. Ramamurti, “Reverse Innovation, Emerging Markets, and Global Strategy,” Global Strategy Journal, 1 (2011), 191-205. N. Kumar and P. Puranam, India Inside: The Emerging Innovation Challenge to the West (Cambridge, MA: Harvard Business Press, 2012). García-Canal and Guillén, “Risk and the Strategy of Foreign Location Choice,” 2008. Caves, Multinational Enterprise, 1996; Cuervo-Cazurra, “Extending Theory,” 2012; Diaz Hermelo and Vassolo, “Institutional Development,” 2010; Goldstein, Multinational Companies, 2007, pp.99-102; Lall, New Multinationals, 1983; D. Lecraw, “Outward Direct Investment by Indonesian Firms: Motivation and Effects,” Journal of International Business Studies, 24.3 (1993), 589-600; Ramamurti, “What Have We Learned About Emerging Market MNEs?” 2009. Lall, New Multinationals, 1983; Lecraw, “Direct Investment,” 1977. Guillén, The Rise of Spanish Multinationals, 2005; see also A. Goldstein and W. Pritchard, “South African Multinationals: Building on a Unique Legacy,” in Emerging Multinationals, ed. by Ramamurti and Singh, 2009. J. Barney, “Strategic Factor Markets: Expectations, Luck, and Business Strategy,” Management Science, 32.10 (1986), 1231-41; C.C. Markides and P.J. Williamson, “Corporate Diversification and Organizational Structure: A Resource-Based View,” Academy of Management Journal, 39.2 (April 1996), 340-67; M.A. Peteraf, “The Cornerstones of Competitive Advantage: A Resource-Based View,” Strategic Management Journal, 14.3 (March 1993), 179-91. Guillén and García-Canal, Emerging Markets Rule, 2013. C.A. Bartlett and S. Ghoshal, Managing Across Borders: The Transnational Solution (Boston: Harvard Business School Press, 1989). K. Moghaddam, D. Sethi, T. Weber, and J. Wu, “The Smirk of Emerging Market Firms: A Modification of the Dunning’s Typology of Internationalization Motivations,” Journal of International Management, 20 (2014), 359–74. “China Buys Up the World,” The Economist, November 11, 2010. P. Deng, “Why do Chinese Firms Tend to Acquire Strategic Assets in International Expansion?” Journal of World Business, 44.1 (2009), 74-84. J.H.Dunning, “Relational Assets, Networks and International Business Activity,” in Cooperative Strategies and Alliances, ed. by F.J. Contractor and P.E. Lorange (Amsterdam and Boston: Pergamon Press, 2002), 569-94. García-Canal, Esteban and Guillén, Mauro F.. "The Rise of the New Multinationals." In Reinventing the Company in the Digital Age. Madrid: BBVA, 2014.